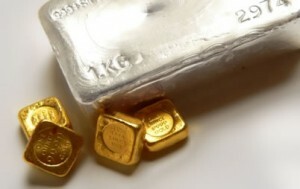 Gold and silver futures declined on Tuesday as profit-taking pressure pulled prices modestly lower for a second day in a row. Gold for April delivery shed $1.10, or less than 0.1%, to settle at $1,262.90 an ounce on the Comex division of the New York Mercantile Exchange. "It looks like the market is a bit more open to the idea that the Fed will tighten policy this year and that likely has convinced some players that they should take some money off the table," Reuters quoted Bart Melek, head of commodity strategy for TD Securities in Toronto. Gold prices ranged from a low of $1,261.10 to a high of $1,279. They slipped on Monday by 0.5% after advancing 4.1% last week and ending at a 13-month high. Silver for May delivery declined 24.3 cents, or 1.6%, to settle at $15.39 an ounce. Silver prices traded between $15.38 and $15.76. They fell by 0.4% in the previous session. April platinum declined $12.60, or 1.3%, to $989.40 an ounce, ranging from $984.60 to $1,009.30. Palladium for June delivery declined $10.75, or 1.9%, to $566.85 an ounce, trading between $561 and $581.65. Gold turned down $7.80, or 0.6%, to $1,262.90 an ounce. Silver was unchanged at $15.66 an ounce. United States Mint bullion products posted their first gains this week with sales of gold coins totaling 10,000 ounces and American Silver Eagles up by 759,000 coins. This week, the U.S. Mint limited sales of Silver Eagles to 1 million. Distributors ordered 75.9% of them claimed on Tuesday, leaving 241,000 left until more become available next week. Their cumulative total hit 11,759,000 coins, or 28.7% higher than through the same time in record year 2015.